Tried their Kobe Beef Burgers (a nose-bleed inducing $6 each as I would probably need to eat at least 3 of them to be full) in the upstairs bar. They are slider-style burgers, supposedly made with Kobe beef. They came cooked to medium-well instead of the medium-rare I asked for and I could not taste much beef flavor as the patties were drenched in some sort of (admittedly tasty) steak sauce and covered with sautéed onions. Still, these were enjoyable little buggers—I just could not taste the supposedly superior beef they used. By the way, the other two small dishes I tried at Stanton Social were kind of meh. One was a very standard-tasting chicken mole roll and the other a failed attempt to be cute called onion soup dumplings which featured really thick, chewy dumpling skins that contained not a lot of onion soup, mostly just onions. Though for a bar that is mostly about style, I have to say the few items we tried were promising. Chargrilled Burger with Roquefort Cheese ($15, the most expensive burger of the bunch, though arguably the Stanton Social sliders are even more expensive). The pattie looked a little weird to me. I wonder if they always make them like this here? It was like a perfect flat cylinder with straight sides and almost a right angle where the side met the top of the pattie. A little too well formed, if you know what I mean. Didn't look hand-packed, more like it was packed using a mold. Also, despite its name and the appearance of grilled marks on the pattie, there was no charred taste at all. Nevertheless, it was cooked to medium rare as requested, was delightfully moist and pink in the center and had a powerful, beefy flavor. Well, I meant, I would have enjoyed the beefy flavor had it not been topped with a gigantic wad of Roquefort cheese (a type of blue cheese). It was bizarre, it was like eating a burger-textured blue cheese sandwich. The beef is there, you can see it and you can feel the juices and the texture, but you just can't taste it. The cheese is so strong that it completely overpowered all other flavors. I think it’s an interesting attempt to create a unique burger, but it’s just too much. I suppose if you love Roquefort you might like it this way. Better, I think, is if they smeared just a thin layer of Roquefort as the pungency and sharpness would create a nice contrast to the meatiness. The only reason I know the beef tasted flavorful at all was because I managed to sneak a bite without a wad of blue cheese on it. I also hated their choice of fries. I’m not a big fries guy and I'm not here to review fries or sides, I just don’t care too much about them, one way or another. I mean, if fries didn’t come with a burger, I would not order it on the side. But their choice of shoe-string fries was so annoying to eat that I have to mention it. So thin that they register no taste in the mouth or much crispy texture either. They were a pain to eat because you can only pick up one or two strings at once and all the effort of putting that in your mouth resulted in no taste or textural feedback. Zip Burger is this cheesy, Anytown USA looking fast food joint on the Upper East Side. 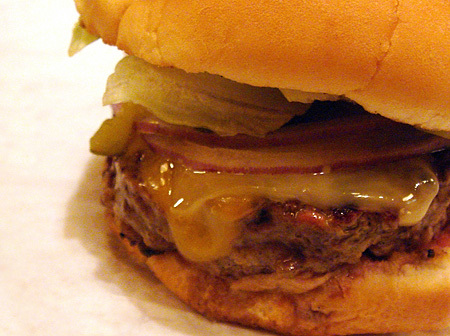 You build your own burger from a list of available patties, toppings and sauces. I got a Classic Burger ($4.50) topped with chedder (50¢) lettuce and tomato (50¢) and mayo. It’s the only place I tried that did not ask me how I wanted my burger cooked and it came cooked to medium. I enjoyed this more than the Spotted Pig and Stanton Social mostly because it was a good, standard burger that I could fit in my mouth without leaving stretch marks and that had no pungent cheeses or heavy sauces to cover the beef taste. Helped that it only cost $5.50. I don’t mind paying a lot for good eats, but I certainly give bonus points when they are cheaper. I didn’t rate this higher because despite the absence of the aforementioned pungent cheeses or heavy sauces and its reasonable size and price, it was just non-memorable. Other than not being cooked to medium rare, nothing much was wrong with it per se, but it still didn’t pack a lot of flavor punch. It just tasted like a good fast food burger, nothing more, nothing less. Rare is this staid, Upper East Side-looking bar that seemed like it would be filled with white, middle-aged men in suits after work. Whether that is true or not I'm not sure as I went in the middle of a weekday afternoon and there were only a couple of white, middle-aged men in polo shirts there at the time. The Rare Classic with Chedder ($11) came cooked to a tad over medium rare but close enough that I shouldn't complain. Either it’s due to the blend of beef used or not enough sitting after cooking, all this juice poured out of the pattie when I took a bite (which was difficult to do because the burger was just so huge—too big!!). Juice was all over the place and it kind of sucked all the moisture out of the pattie and the giant burger threatened to fall apart right in my hand, disintegrating into a mess of soggy buns and dry, crumbly pattie pieces. To its credit, it held together and despite juice all over the place (my hands, the plates, the buns), the pattie remained fairly moist and there was a definite high-quality beefy taste to it. And even though I said I prefer a more reasonably sized burger, a gigantic one does appeal to certain primal urges. Sometimes you want to stuff your face with a burger that is the size of your head. I remember walking out of there in a happy, meat-induced daze that day. I had high hopes for the Blue Smoke Burger ($11.50 + $1 for chedder). I absolutely adore the Shake Shack and I figured Blue Smoke being part of the Danny Meyer empire, must also be good, and perhaps, dare I dream? even better. 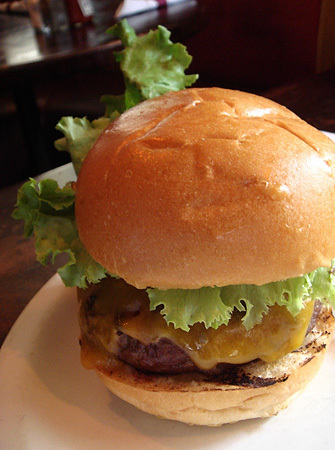 Like the other "restaurant burgers", it’s just too big (though not as big as the one from Rare). And if I thought too much juice poured out of the Rare burger, I hadn’t seen anything yet. 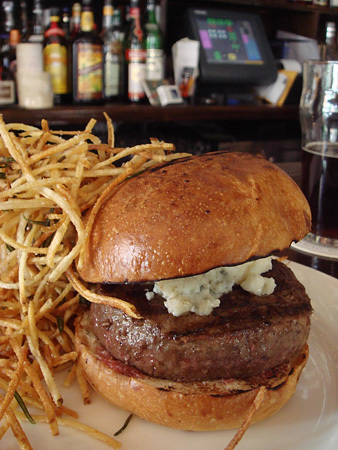 When I took a bite of the Blue Smoke burger, it was like a geyser of meat juice was right in the middle of my burger. It spouted juice vigorously for what seemed like an eternity (okay, a couple of seconds, but I’ve never seen meat shoot juice out like that). Despite ejecting all that juice, the pattie remained surprisingly moist (even more so than the Rare Burger) and was full of beefy goodness. Luckier still, the buns were spared a soaking because the juice was literally shot out of the pattie with such force that not much was on the buns. No kidding. 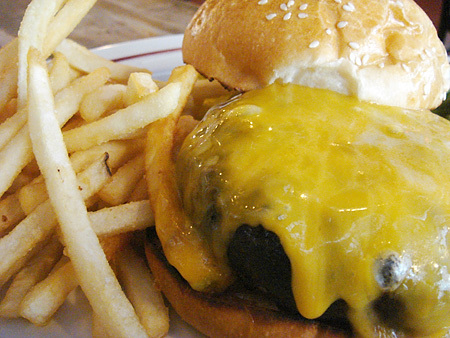 It is the only burger in this roundup that had a nice charred taste to it, a definite plus. By the way, I know this is about burgers, but Blue Smoke has amazing fried chicken. Try it. Too bad I was so adverse to venturing much past 14th Street in the past because I missed a jem of a burger ($6.50) from Burger Joint. I love the idea of a dumpy burger place nestled behind curtains in the lobby of a fancy midtown hotel. Gimmicky, yes, but a great juxtaposition nevertheless. 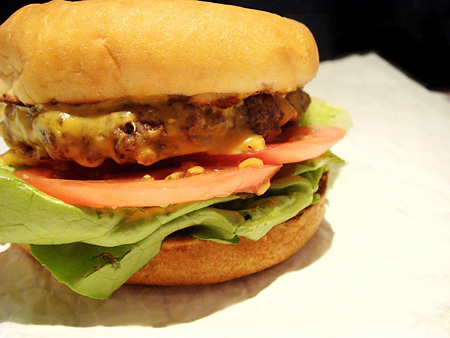 Burger Joint's burger is the West Coast-style fast food burger that I prefer. I think that’s the perfect size where all the ingredients are in balance (bun, produce, meat). The bun is not the most exciting, just a plain burger bun that probably comes packed in a bags of 100, but everything else about the burger was superb. It was cooked perfectly to medium rare. No fountain of juice excreted from the pattie, it was extremely moist and wonderfully full of beefy flavor. Just a very satisfying and enjoyable burger. The six burgers are closer than perhaps putting them in a ranked list would indicate. Like I said in the opening paragraphs, even the "worst" of the bunch was good. Go out and eat a burger today! You should, since I couldn't. I'm in a city full of crappy burgers. I'll go eat a Burger King Whopper now while I cry.